When this kit first found its way across the editorial desk, Ithough 'neat, a truck model'. I have always liked truck models like this,especially those that are unusual. Knowing absolutely nothing about this kit,I'll have to paraphrase from the kit instructions. "In the mid-1930s, the Praga factory in Prague,Czechoslovakia was producing two three-ton lorries (trucks to us NordoAmericanos). One was a 72 HP 6-banger gasoline engine, and the other was a 60HP4-popper diesel. This kit is the diesel. During WW2, these vehicles were supplied mostly to the SlovakianArmy. The Germans didn't like them as they were not designed to run off paved orhard surfaced roads. As a result, they weren't very successful for an army onthe move. However, they worked just fine for duties in the rear where theywouldn't be put to hard use. After the war, there was a move afoot to replace all the prewarvehicles in the new Czechoslovakian army with new build ones. Though many typeswere replaced, the availability of new types was insufficient to replace themall so older types were modernized in an attempt to upgrade them. 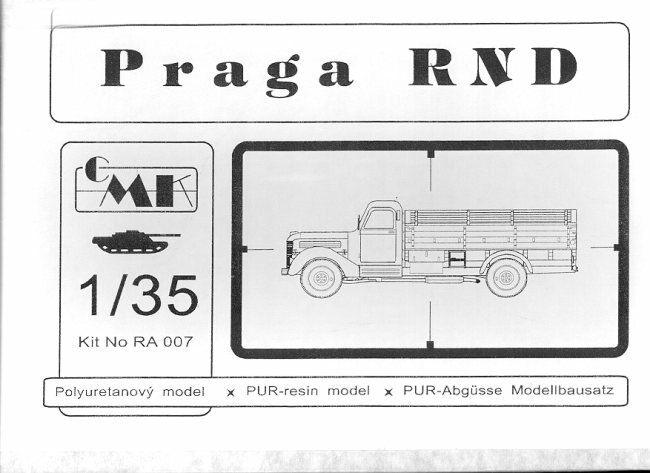 Despite theseattempts, the Praga RND was still basically a civil road truck and unable tomeet the needs of combat units." Though the short history doesn't state as much, I can imaginethat the type stayed around well into the late 50s and even the early 60s. CMK has been doing quality resin parts for a number of years.This complete kit is no different. Molded in a greenish tan and tan resin, theparts are superbly detailed and totally devoid of any air bubbles. That initself is great news. It really is an incredibly well molded kit. 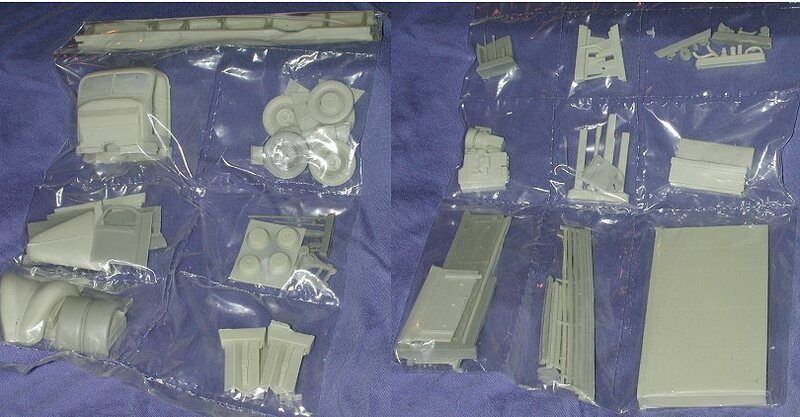 Flash ispresent, but, like the resin blocks on which the parts are molded, it is to beexpected from any resin kit. Included is a sheetof clear acetate for the windows and a medium sized fret of etched metal. Theetched metal is for things like grille, bumper springs, grab handles, licenseplates and holders and other minor bits. This isn't a curbside but includes afull engine as well as a separate frame and chassis. The kit has no decals, butdoes have paper license plates that you can use. Instructions are an eight step affair and are quite complete.All the parts are numbered and some are named. The builder will have to do asmall amount of extra work in the engine for wire and fan belts as well ashaving to drill an additional hole or two, but nothing that the average modelercouldn't accomplish. The colors of the finished product are either khaki or panzergrey. There is no other coloring information given other than the final paint,but I would think that a few parts had some alternate colors tossed around inthere somewhere. I know of no reference for this truck, but the really dedicatedmilitary modeler should be able to find something about it. Frankly, this is a kit that I like. For some reason, I'd ratherdo a truck or armored car than a tank. There is something about them that holdsmore interest to me. Looking back on the few military subjects I have built inthe last 25 years, I can find only about 3 tanks. The rest have been soft skins,artillery pieces or armored cars. This should be an interesting and fun build. If you would like yourproduct reviewed fairly and quickly by a site that has over 1,300 visits a day,please contact me or see other details inthe Note toContributors.